I enjoy working with nursery rhyme and fairy tale themes. When I showed this to friends from Japan they were confused and did not know the significance. They did not know the nursery rhyme. They said if there was a rabbit and the moon it would have made sense to them. Culture is fascinating to me. The little Dog laughed, To see such sport, And the dish ran away with the Spoon. This entry was posted in Bento / Cute Food, Food and tagged Nursery Rhyme. Bookmark the permalink. Very creative idea and nicely put together! 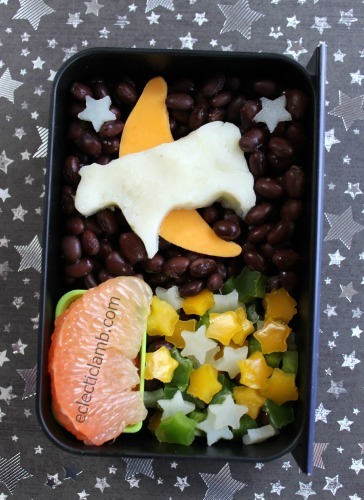 Super cute bento, and I love this nursery rhyme! Now, it’s going to play in my head for the rest of the day, lol.